Among the family things handed down to us (Ben English, Jr. and Jane English) were several journals filled with handwritten accounts of trips to New Hampshire's White Mountains made about 100 years ago by our grandparents, Walter H. James and Ida Rachel Butterfield James, and great aunt, Lucy Ardena Butterfield. They are liberally illustrated with black and white photographs. We had both looked at them occasionally but did not realize until recently what a treasure they are. During the winter of 2004-2005 we typed the text into the computer and scanned the photographs to create this book. Our Mountain Trips is unlike any other book published about the White Mountains. Though written a century ago, when hiking and camping were enjoyed in a more leisurely fashion, these narratives have a vigorous and refreshing quality to them. The reader senses that the authors would be delightful trail companions. The fascinating text is accompanied by hundreds of crisp black-and-white photos of familiar peaks and forgotten places. This beautifully-rendered book will be a treasured addition to the library of anyone who loves this storied region. - Steve Smith, co-editor of the Appalachian Mountain Club White Mountain Guide and proprietor of The Mountain Wanderer Map & Book Store in Lincoln, New Hampshire. Though I have never been a hiker or a camper, I found this book to be really interesting. 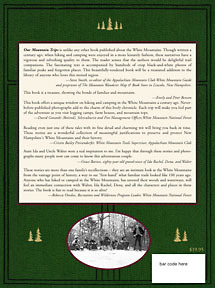 This book offers a unique window on hiking and camping in the White Mountains a century ago. Never-before-published photographs add to the charm of this lively chronicle. Each trip will make you feel part of the adventure as you visit logging camps, farm houses, and mountain tops. Reading even just one of these tales with its fine detail and charming wit will bring you back in time. These stories are a wonderful collection of meaningful justifications to preserve and protect New Hampshire's White Mountains and their history. Aunt Ida and Uncle Walter were a real inspiration to me. I'm happy that through these stories and photographs many people now can come to know this adventurous couple. These stories are more than one family's recollections ­ they are an intimate look at the White Mountains from the vantage point of history, a way to see "first-hand" what familiar trails looked like 100 years ago. Anyone who has hiked or camped in the White Mountains, has savored their woods and waterways, will feel an immediate connection with Walter, Ida Rachel, Dena, and all the characters and places in these stories. The book is fun to read because it is so alive! The first couple of trips in this volume were handwritten in the big old bound journal whose cover was used as the background image for the front cover of Part I. By 1910, that book was full, and there follow several home bound collections of typewritten pages interspersed with pages having photos pasted on them. In 1920 they started to fill two large hardbound green scrapbooks, pasting the photos and typed text onto the scrapbook pages. The cover of one of these scrapbooks forms the background for the cover of this Part II of Our Mountain Trips. The authors of Our Mountain Trips wrote with a keen wit and a fascinating eye for detail. Readers will become immersed in days gone by that feel remarkably familiar to the modern-day "tramper." The narratives and the photographs bring the reader along easily-recognizable roads and trails that remain a delight to adventurers these many decades later. Everyone should read this book with a firm purpose to preserve these mountain paths and trails for future generations to enjoy with the same passion as past generations. -Julia and Bob King, enthusiastic, seasoned hikers, Glen, N.H. 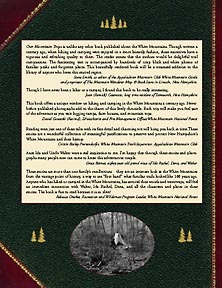 This book is a wonderful collection of stories of family bonding and of adventures in the White Mountains. These adventures occur before high-tech synthetic clothing, hydration systems, and lightweight tents! It is interesting to see the evolution in transportation methods to and from the mountain trails, from horse carriages to railroads to the automobile. To hikers who have visited the area many times and to those new to the mountains, this book is a true delight! The fascinating thing about these books is how they reflect, in very personal ways, the dramatic social and technological changes during the period they were written ­ the Great War, the automobile, women's suffrage ­ really the cusp of the old and modern world. The later trips almost sound like trips that could have been made today. Certainly, historically-minded hikers of today would love to take a trip back in time to experience the White Mountains of days gone by. Until a time machine is developed, though, they'll have to settle for this book to provide a remarkable view of New Hampshire's woods and summits of yesteryear. What a gift ­ reading these books makes one long for sunny mountain days, the scent of balsam fir, and the song of the white-throated sparrow. How generous of Jane and Ben English to share their remarkable family journals and photos with us, and to give us a glimpse of the adventures of White Mountain visitors of about a century ago, "trampers" and "automobilists" alike. This book is a rare treat for New Hampshire hikers, and for all who are interested in the history of exploring the forests and hills of New England.